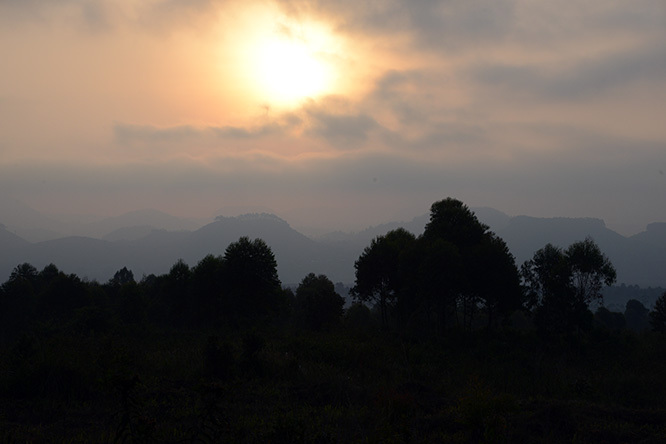 My main motivation for visiting the Congo was to visit Virunga Natinoal Park with a goal of seeing the mountain gorillas and the volcanoes. I spent a few days here, and these two photos above and below were my first views of the area. It was early morning and the sun was still coming up over the surrounding mountains and volcanoes. Once you arrive to the park, it’s mandatory you have an armed ranger accompany you. I entered at a time when the park was seeing some important recovery and stability after issues with rebels in the area. 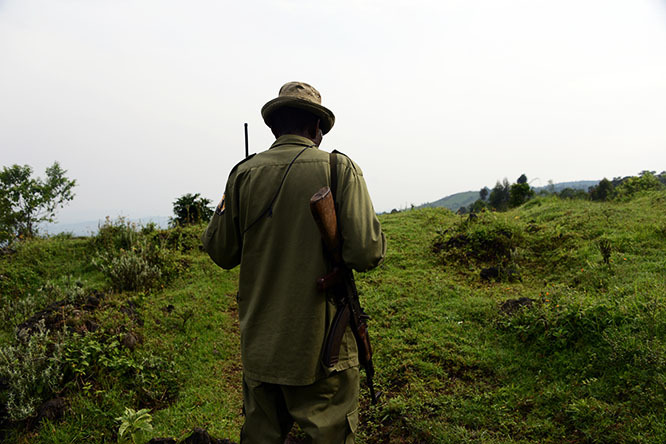 The park rangers here have a very difficult job of protecting not only the wildlife but also themselves. Some have lost their lives due to rebel attacks as recently as two years before my visit! Things have improved since, and hopefully will continue to go that direction. 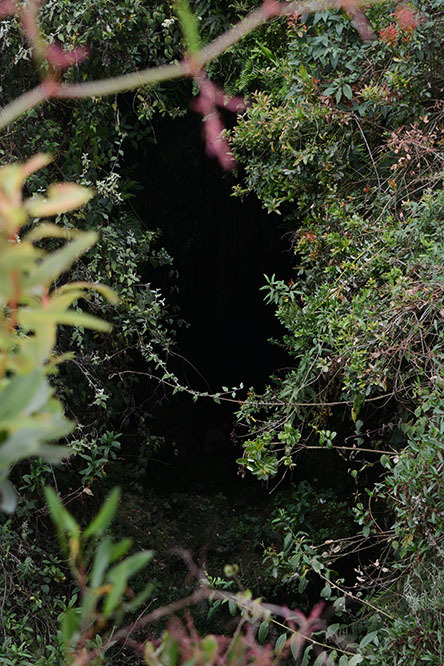 I started off with the ranger from one of their outposts, following a simple trail that passed through mountain farmland before entering dense forest photographed below. 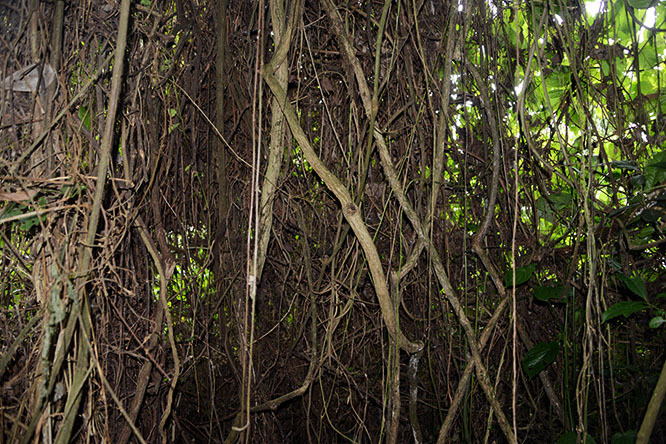 The forest was definitely very think with lots of dense foliage and vines that acted as drapes blocking your views. It’d seem nearly impossible to spot any wildlife in these forests unless you were only a few feet away from them. It’s very possible to do a gorilla trek and not see anything at all since they are wild animals and free to go where ever they want! 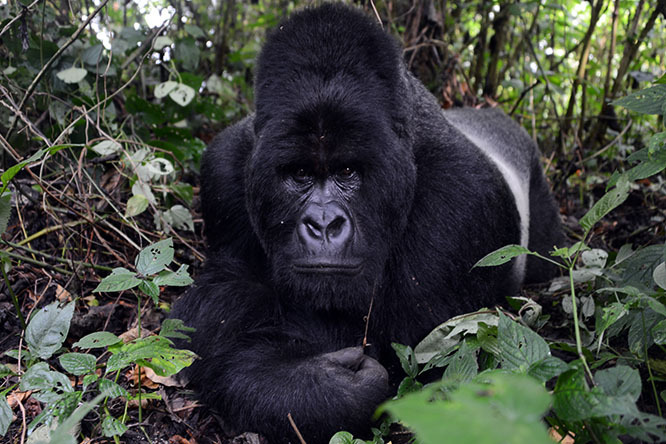 Since it’s never guaranteed that your gorilla trek will mean an encounter with these majestic animals, this could be kind of hard to swallow for someone who traveled across the globe and might not ever come back! 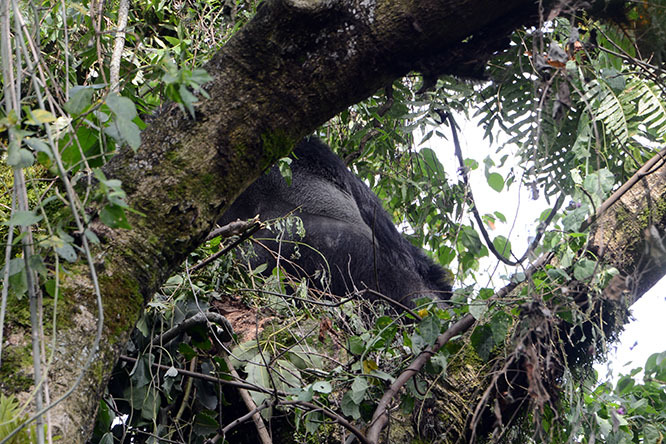 I was fortunate and saw this gorilla up in a tree pretty quickly. He was far away and the photo was taken at full zoom. I was annoyed that he didn’t turn around to face the camera, and was worried this might be the best viewing of one that I’d get. 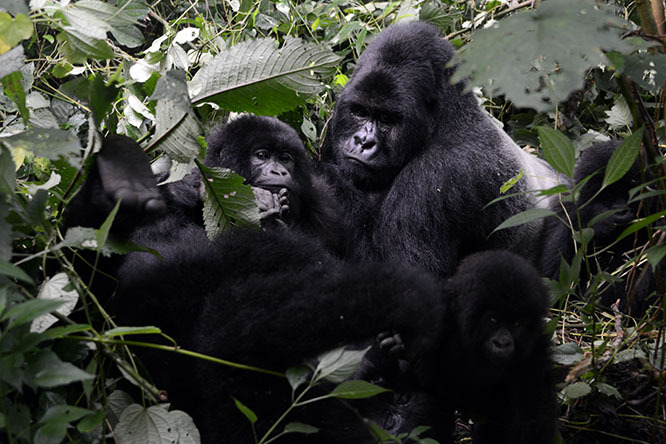 After we continued trekking some more we stumbled right into this gorilla family photographed below. Gorillas in large numbers are known as a troops. I was surprised how close I was able to get to these guys. 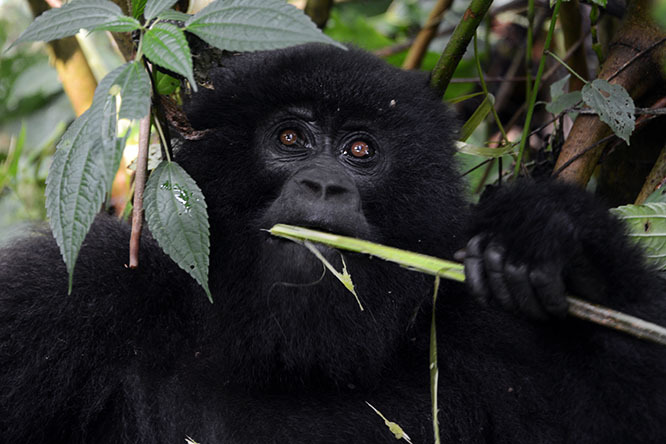 Although gorillas do occasionally eat meat, they are generally herbavores. They are also very peaceful animals despite their power and enormous size. The largest gorilla here was likely around 400lbs (180kg), although some overfed gorillas in captivity have become obese and weighed as much as 600lbs (270kg). Most of the gorillas in this troop were sleeping, but a juvenile was eating while a baby played around by poking at its lazy family members and climbing the trees. 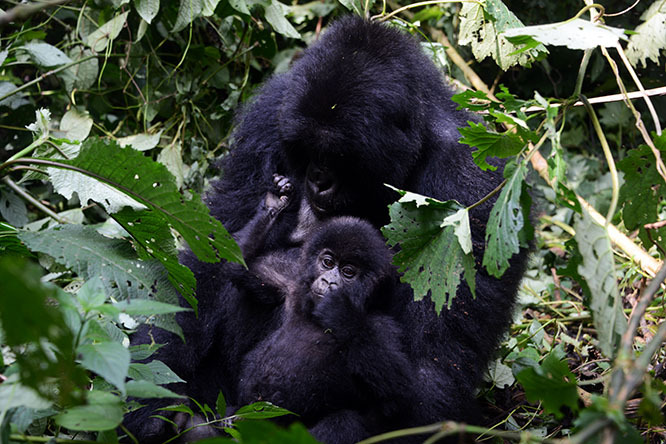 I was told by the rangers that this baby was only seven months old, and that mountain gorillas often live up to be 45 to 50 years old. 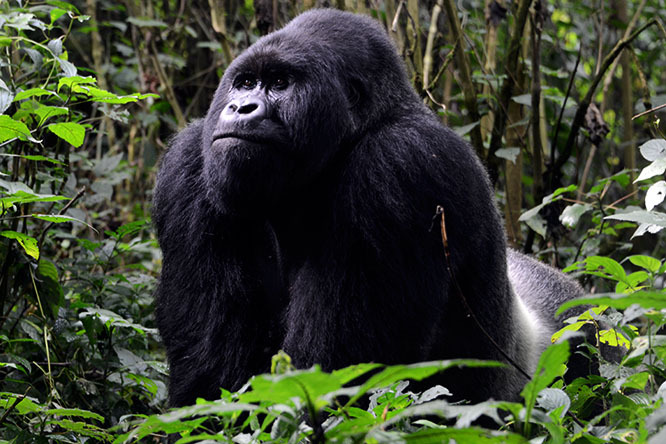 One of the large male gorillas I later came across I was told was 22. I didn’t ask about the gorilla that’s holding the baby below, but my assumption is that this is the baby’s mother. I did see some other gorillas holding and playing with the baby like a parent would, but the baby seemed most affectionate with the gorilla holding it in the photo above. I wasn’t even aware of this until I arrived to the Congo, but until recently most scientists had classified all gorillas as a single species. They were later broken down into four subspecies, west lowland gorillas and cross river gorillas, east lowland gorillas, and then what you see here, the mountain gorillas. 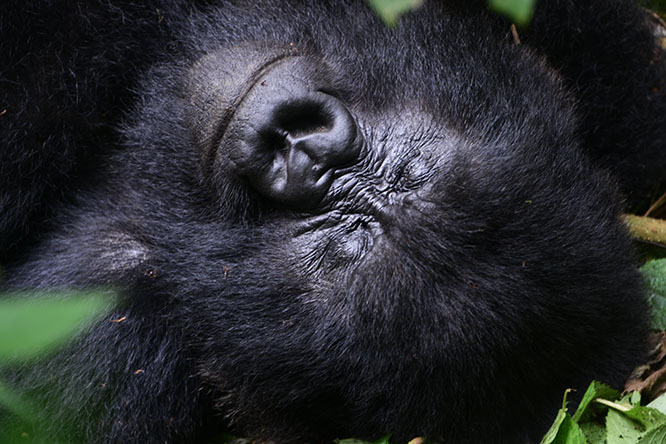 The mountain gorillas are among the second most endangered of all the species, with only 600 left in the wild! My last photo of the gorillas is this mean looking but actually nice gorilla. 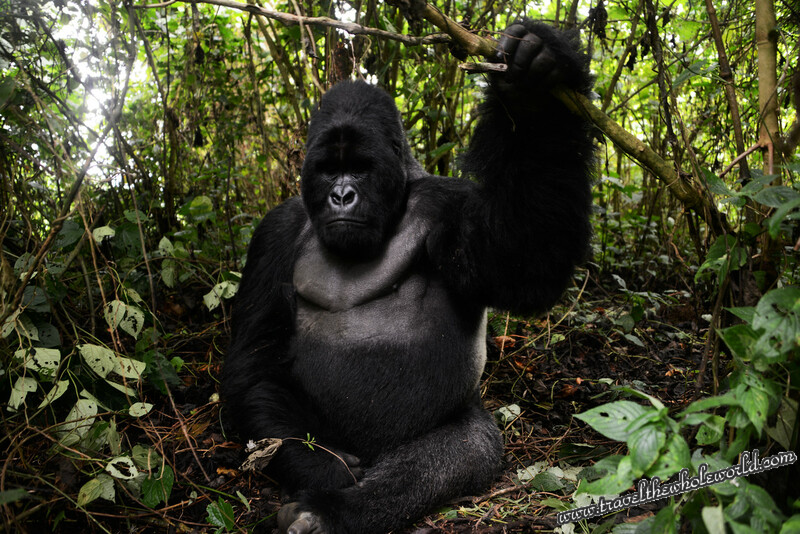 This guy is the alpha male of the group and by far the largest gorilla I saw while in Virunga! It’s truly amazing to see such a huge powerful animal and be able to make eye contact with it. With such an endangered species, I truly hope they make a full recovery in the future. See my short video below that I took as I walked past the alpha male. 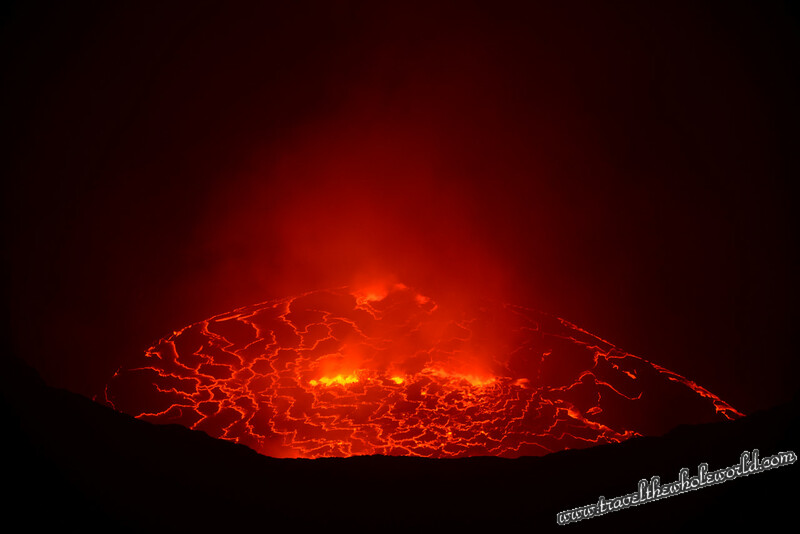 My other big adventure in Virunga national park was to hike the Nyiragongo volcano. This is one of the most active volcanoes on earth, and so far in my travels it’s the most incredible volcano I’ve ever seen. 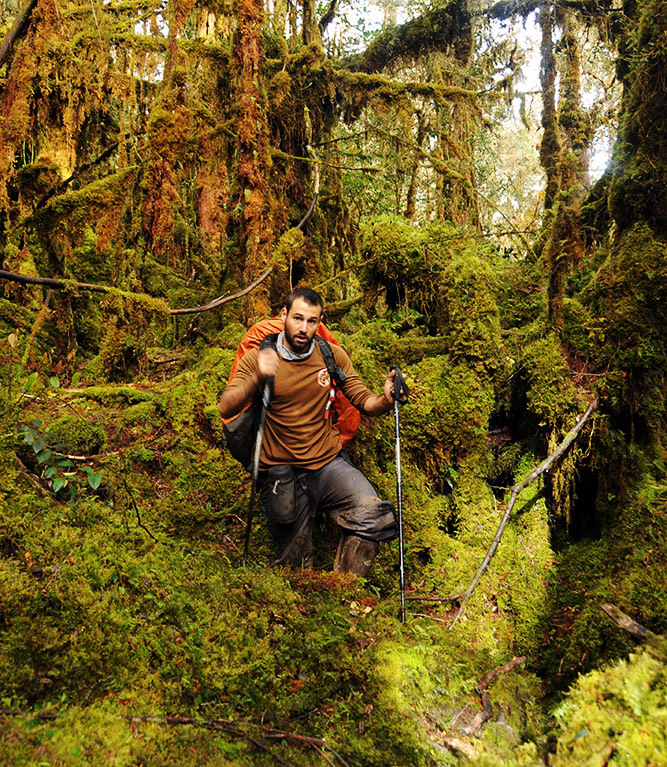 The hike is only five hours in total and begins in tropical forest with relatively gentle terrain. 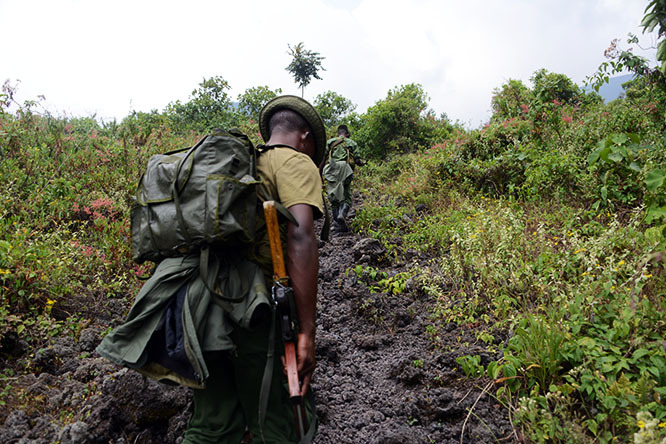 Like the rest of the Virunga national park, armed rangers are also required to tag along with you! 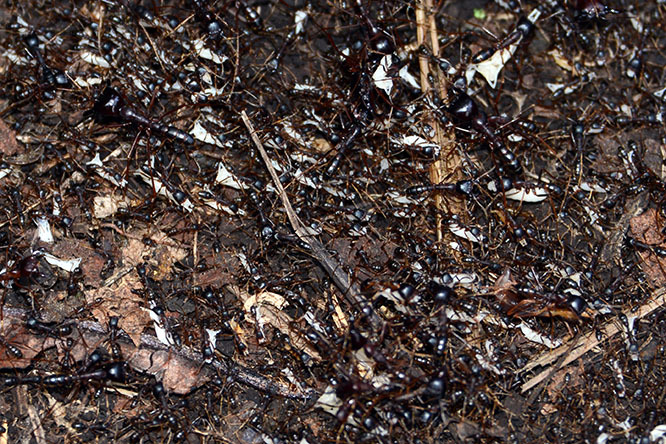 While in the forest on the lower altitudes I stepped over this trail of giant ants. I stopped to photograph it and afterwards noticed that some of them had noticed me too. 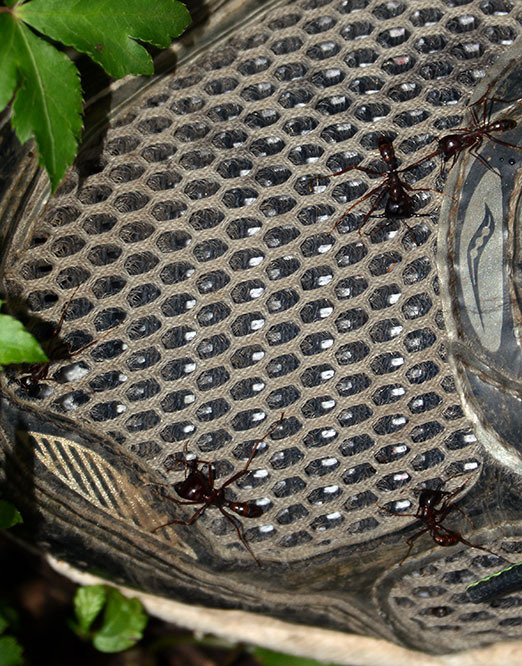 I had a number of them latched onto my shoes that never let go and I had to pick each one of them off. I imagine it’d be painful to be bit by these! There is a wide range of flora and fauna on the volcano, especially when you consider the altitude changes brings about different ecosystems. Of course like every other hike, you have to be pretty fortunate to actually spot any wildlife. The gorillas do not take refuge on the volcano itself, but aside from them most every other animal that lives in the park can be found here. 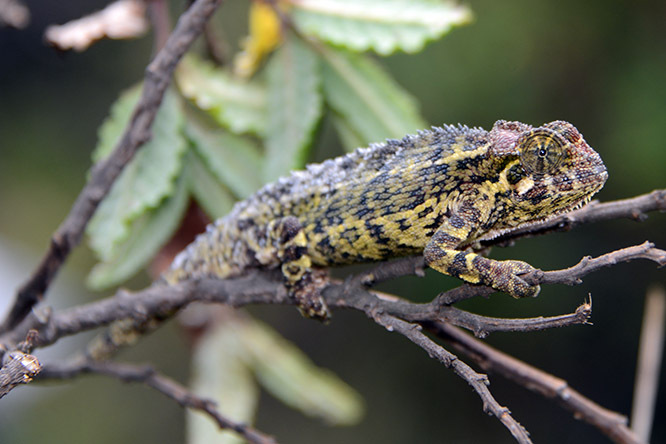 Somehow a ranger hiking spotted this chameleon! 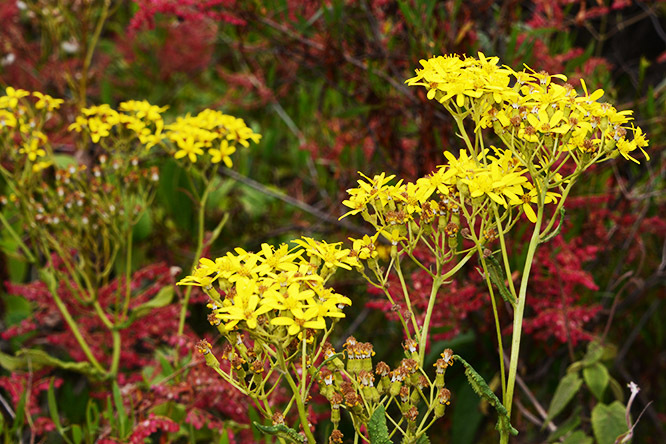 Below is a shot I took of some of the flowers seen along the trail. 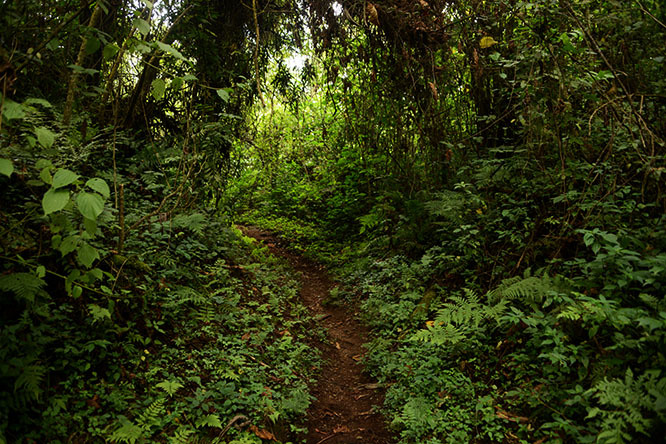 After about an hour of hiking you’ll leave the thicker forest area and enter landscape that is mostly covered with shrubs and small plants. 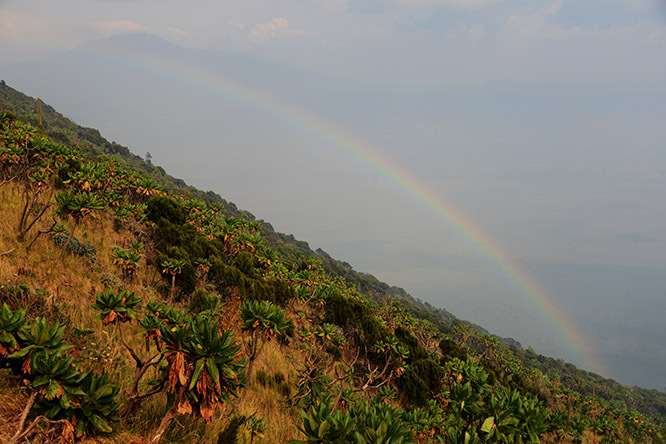 The lack of trees is not because of the altitude gain, but because the 2002 volcanic eruption sent lava down this side of the volcano destroying everything in its path, including the city of Goma. 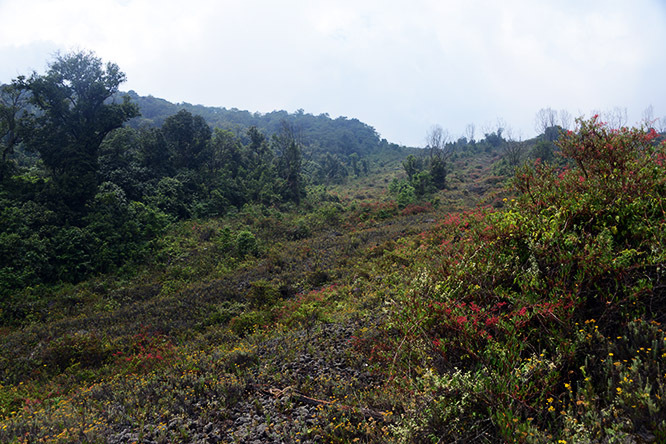 With the lack of vegetation at this point of the hike it was pretty easy to see the entire volcano. 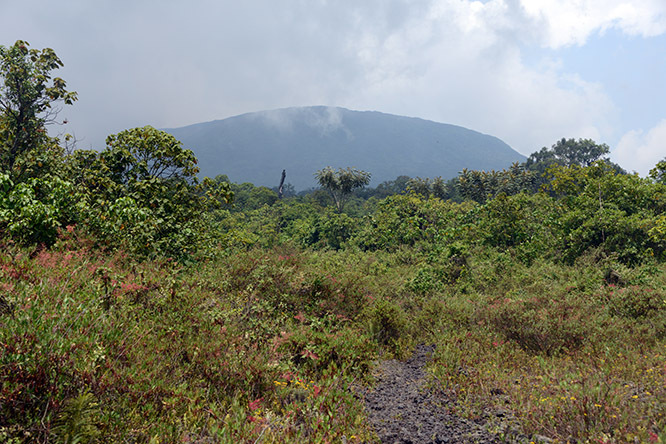 The top of the Nyiragongo looked far away, so it was hard to imagine that this entire hike was only five hours to the summit! Soon after the trail had changed from dirt to small lava rocks and was much steeper. This photo actually shows the source of the 2002 eruption. The eruption did not come from the summit, but from actually from this hole that blew out the side of the volcano! 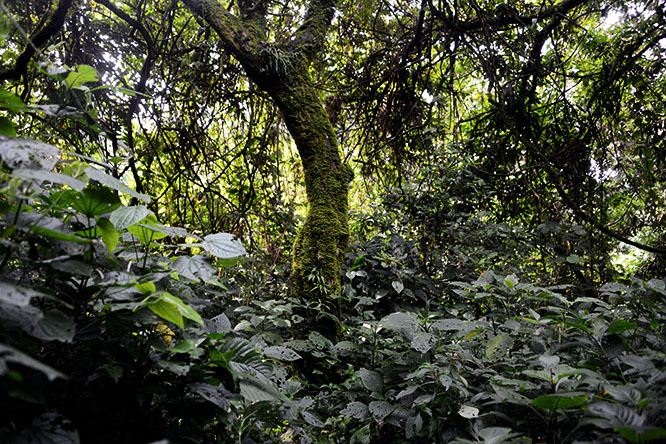 Since a lot of time has passed, most of the area is covered again by vegetation. 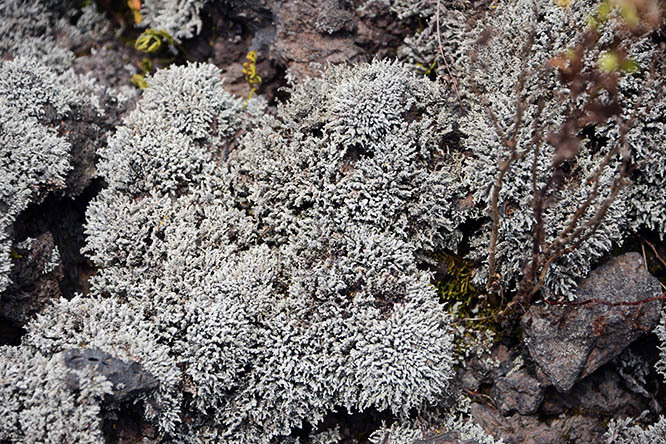 It seems this grayish lichen above is the first to take back the terrain followed by these plants below. Just in a single day we had all kinds of weather during the hike. Hot and sunny, rain, cool with overcast, fog, and even high annoying winds storms. I don’t like the sun on me when I hike, so I was pretty happy when I saw these clouds rolling in and was able to hike in the fog for a while. It later started to rain hard enough that I had to put my camera away for a bit. 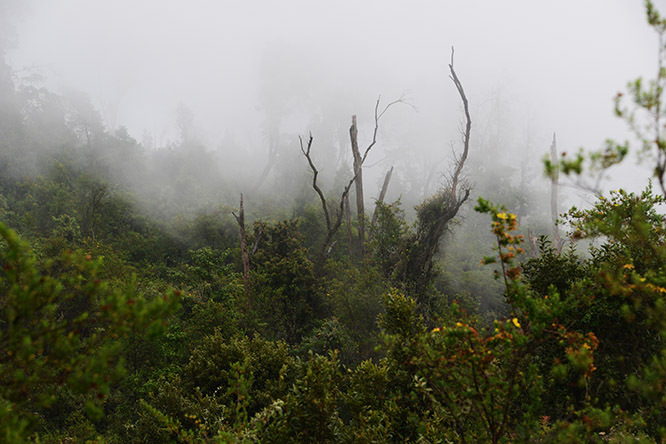 The rain greatly reduced visibility but when the rain stopped, I noticed the vegetation had completely changed. 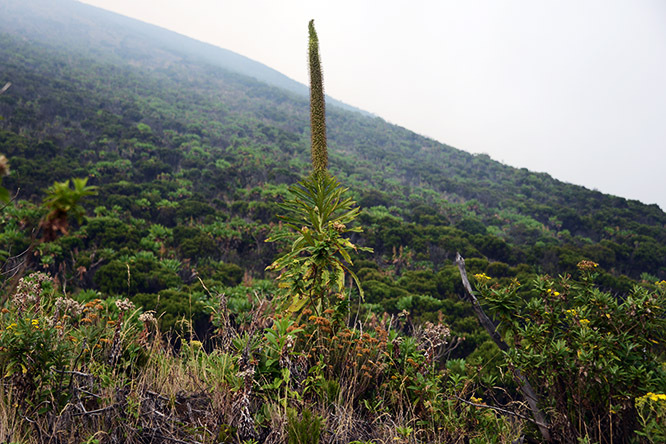 This tall plant here reminded me of a much smaller version of Seneca plants that I saw on Kilimanjaro. The rainstorm was a bit annoying to hike in, but I was rewarded with this nice rainbow below! After another 90 minutes or so, I finally arrived to the summit. 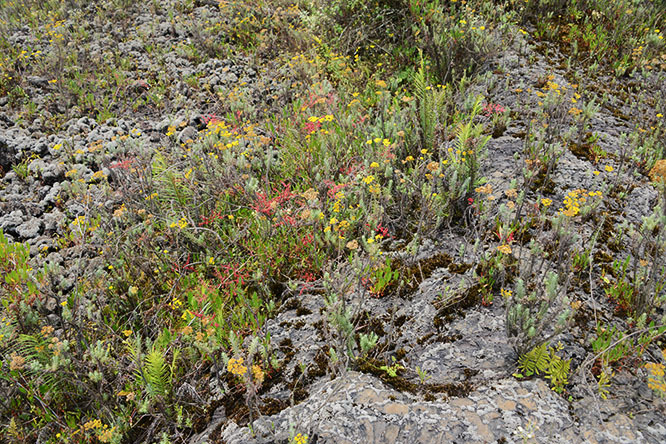 There is very little plant life up here, and the terrain is mostly just lava rocks. I don’t believe the lack of plants is because of the altitude, but probably rather from the powerful winds here. I spent the night at the summit and the winds definitely had to gust over 70mph at times! 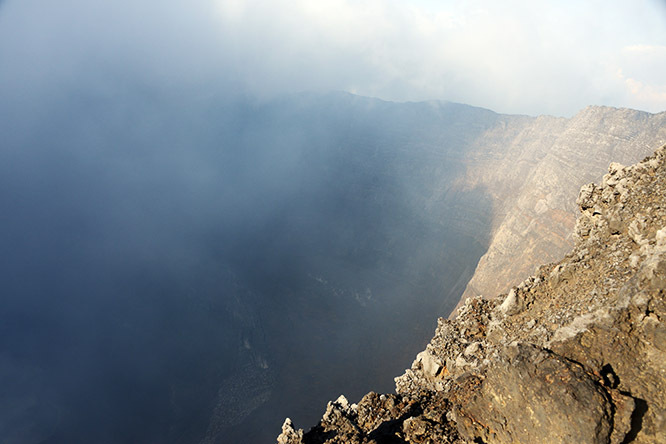 Above is a photo of the summit crater during the day, while below is one at night. You can see that it’s not so impressive in daylight because you can’t see the lava as well. 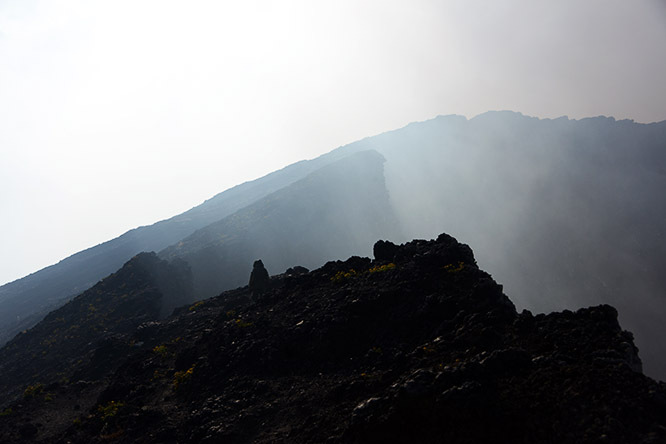 Sleeping on the summit is essential so you can truly experience and see into Nyiragongo’s crater! 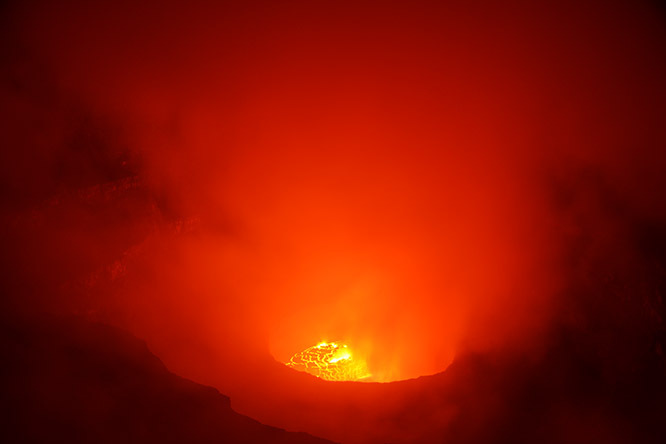 This is actually the largest lava lake on planet earth, and I’ve never seen anything like it! 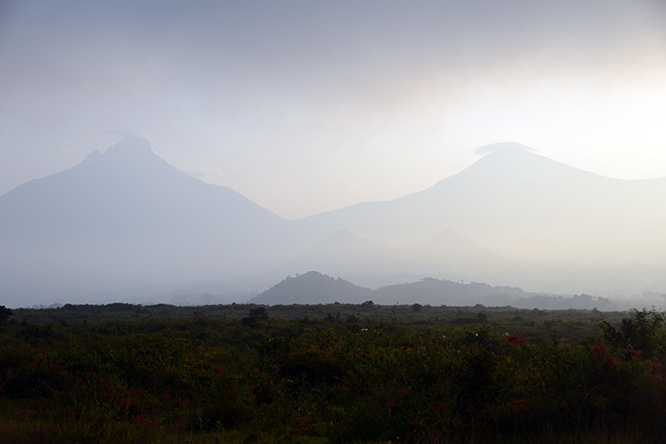 This volcano as well as the nearby volcano Nyamuragira are responsible for nearly half of all of Africa’s volcanic activity! The altitude here is 11,382 feet (3,470 meters) and is high enough to bring in chilly temperatures. Everyone asked me if I was hot peering into the lava lake, but you actually have to maintain a safe distance because of the heat and toxic gases. From where I was, I was actually quite cold with the combinations of temperatures of less than 50F, (10C) and strong winds. See my video below of my hike to the summit!